This 1/3 ounce 3/4 inch by 3 3/4 inch fishing spoon is a must have for your fishing tackle box. Now you can have crank bait action in a spoon. Unique wobble action is the key to catching finicky fish. No other fishing spoon offers this action. 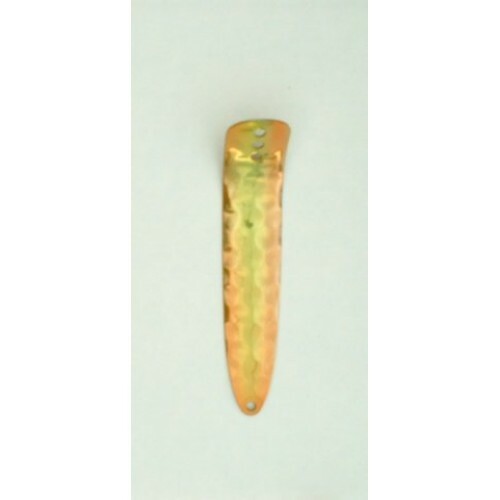 With genuine&nbsp;Silver plate fish scale finish the lure reflects more light to attract fish from greater distances in low light or stained water conditions. This fishing lure has multiple holes in the lip to adjust the wobble action from fast to slow. It is perfect for trolling, casting or jigging. Our salmon spoons are catching limits in salt water and fresh water.